Our Baby T.Rex is great to fit in where you want to give a Pre-historic theme but may not have the room for one of our large Dinosaurs. 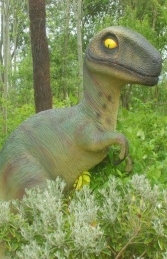 This little Raptor or Tyrannosaurus is a great model for the home or garden or to add to a Dinosaur scene. 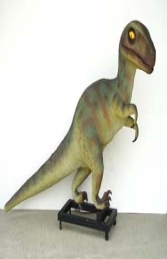 It looks fantastic along-side our 10ft Giant Raptor (JR 1550), the adult Tyrannosaurus (JR 080126) or with the other small Dinosaurs in our range. This model comes on a wheeled metal frame base.